Satellite is a Paris-based jewelry line that was launched by Sandrine Dulon in the late 1980s. Dulon was originally an ethnologist, and her designs are inspired by the antique jewels and other materials she discovered on her travels. The line's first fragrance, Padparadscha, is named for the rare Padparadscha sapphire, and the notes include amber, musk, cedar, sandalwood, juniper and pepper. Padparadscha starts with a nice burst of pepper, and softens to a mildly spicy blend of woods. The juniper gives it a slightly herbal cast, and the amber adds warmth without any sweetness. It is slightly earthy in the early stages; later, it is smoother, and sandalwood and musk are the predominant notes. There is a perhaps a smidgen of powder, but the overall finish is dry (really, really dry), so it might more properly be called dusty. The first time I tried Padparadscha, I had the distinct feeling that I had smelled it before. After trying it next to everything similar I could think of, I would say it isn't a dead ringer for anything else I can find, but it is in the same vein as many other dry wood fragrances, several of which have already been mentioned in conjuction with Padparadscha on the fragrance boards: Ginestet Le Boise, Christian Lacroix Tumulte Pour Homme, or the woodier of the Comme des Garçons Incense series. So it isn't startlingly unique, but it is a lovely fragrance in its own right, and like the others mentioned above, it has a comforting quality that is perfect for another blah day in mid-February. It is rather mild and close to the skin. The lasting power is almost but not quite what you would expect from an Eau de Parfum, but it is priced like an Eau de Toilette anyway — $65 for 100 ml, very reasonable for a niche fragrance — so I have no complaints. And the packaging is gorgeous. 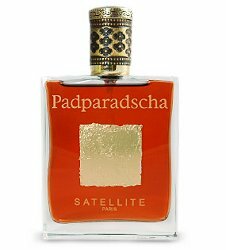 Padparadscha is available at luckyscent in the US or first-in-fragrance in Germany. Satellite also has a boutique on West Broadway in Soho. Robin is the bottle itself orange or is that the juice? It IS such a magnificent bottle. I'm looking forward to smelling this. Lovely review, thank you. It is the juice. It is a sort of orangish-pink, which I guess is the color of the Padparadscha sapphire. I think this one might actually appeal to men more than women, given that it is so dry, and juniper also tends to seem more masculine than feminine. yes well it definitely seems like something that I would wear and I do love Juniper (especially in Creed's Geneivre). I've been admiring that bottle on luckyscent since they first started carrying it. The bottle is beautiful, and it sounds like a perfect woody fragrance for those who love this theme. Thanks for a lovely review! I am having such a blah day, I wish I had some Padparadscha. It sounds like something I might really like. Thank you very much for the review, R! The bottle is very tempting, especially with the price! V, trying to decide if you would like it and can't decide. Blah, blah, blah…I just detest February in PA! and what a wretched February it has turned out to be here in PA, yes?! I wish it would pick a temperature and stay there. One day it's practically 85 and sunny and the next day you have 22 inches of snow on the ground and when you wake up the day after that – 22 inches melted mysteriously overnight – what sadist is responsible for all of this? Your right on that MarkDavid, February's in Baltimore are just as confusing temperature wise, I love Costume National Scent Intense better. I don't know why but I just do. So glad you reviewed this, R.! I really like it. On me it's all dry woods and amber; I never get any musk out of it at all. I won't buy this one, but I'm enjoying my sample! I have to look for this soon. Thanks for the lovely review R! Hope all is well.